When I moved back to Oahu a few years ago, I didn’t think twice about how my new life having fun in the Waikiki sun could cause some noticeable damage to my skin. So, on a sunny afternoon in Hawaii, I’m at Honolulu MedSpa (rather than at the beach) talking to one of their experienced estheticians on ways in which I can reverse some sun spots, fine lines, wrinkles, and improve the overall texture of my skin. After taking a good look at my face, neck and chest, the esthetician recommends I start with a HydraFacial. I’m leery of facials because my skin seems to be very sensitive and erupts with redness with the slightest bit of rousing, poking or prodding, but I was willing to take a chance. The HydraFacial is a liquid microdermabrasion treatment that gently removes dead skin cells and impurities while simultaneously cleansing, hydrating and moisturizing the new skin with a series of serums. The procedure was noninvasive and did not irritate my overly sensitive skin one bit. I left feeling new and with a youthful glow to boot! I instantly saw and felt an improvement to my skin. Of course, one treatment won’t fix your skin forever. The Medspa suggests a series of 6 treatments every couple of weeks to see lasting results beyond just a few days. I’ll be following up with some more treatments to hopefully rid my skin of excess oil, enlarged pores and dull texture. While I wait for my next treatment, Courtney, one of Honolulu Medspa’s amazing nurses on staff, customized a corrective skin product routine for me to implement at home. First, I use a gentle cleanser in the morning and a night. With a fresh, squeaky clean face, I apply C E Ferulic by SkinCeuticals which is a combination of antioxidant vitamins C+E with ferulic acid to better prevent premature signs of aging, while stimulating collagen production which will work to diminish the appearance of photodamage. Next, I layer the Advanced Pigment Corrector, also by SkinCeuticals, which exfoliates and improves skin's luminosity while fighting my spots of hyperpigmentation. Last, but not least, I hydrate with my favorite product HA5 by SkinMedica. This rejuvenating hydrator leaves my skin feeling silky, soft and smooth. I know this sounds like a lot, but by just adding a few minutes to your routine in the morning and a night your skin will improve over time for the better. While I’ve always dreamt of growing old under the Hawaiian sun, I hope my new skin routine coupled with a series of HydraFacials will keep me feeling and looking just a bit younger. There are many luxurious ways to spend the day in Waikiki. Hawaii's playground is brimming with gorgeous hotels, world-class spas and five-star restaurants in which to indulge, rest, relax, dine and unwind in style. Yet, no experience can quite compare to that of idle days spent just off this famous stretch of coastline on the spacious sundecks of Vanessa, a stunning, Bruce Farr designed, sixty-two foot sailing yacht. Vanessa's beautifully maintained wooden decks are superb for lazy days spent thrumming through the waters just off Diamond Head. The expertly trained staff keeps this floating mini-playground stocked with all of the essentials for a complete experience at sea. Fishing and snorkeling gear, water toys, delectable provisions, tasty libations and even a drone to capture your experience, can all be easily arranged. My favorite days on Vanessa are relatively simple: anchored just off Diamond Head with friends, good tunes, sun, one too many bottles of Rose, and tasty snacks. 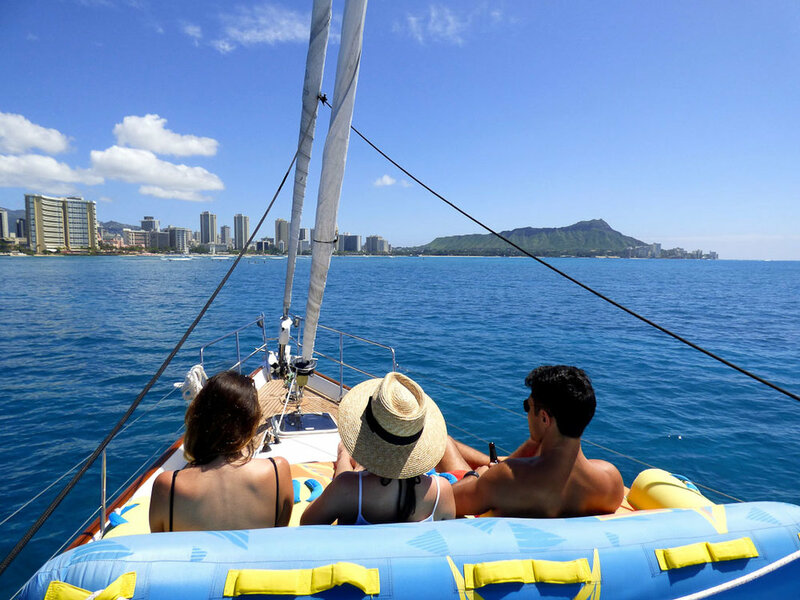 Good times, endless views of Waikiki and the shimmering Pacific Ocean in every direction, Hawaiian sea turtles, tropical fish and, in the right season, a whale spotting or two, highlight a day on the water in Waikiki. It is salty, sun-drenched days like this that make me pinch myself; how lucky am I to call this home? Vanessa is available for private charter adventures including snorkeling and sunbathing at Turtle Canyon in Waikiki, sunset cruising Oahu's south shore, and, if you've got the time, exploring the magnificent Hawaiian Islands for a multi-night stay in her well-appointed quarters. For a sail aboard Vanessa, contact the Captain & Crew at www.charter-hawaii.com! On the western edge of the 96815, resides an urban oasis, the Modern Honolulu Hotel. My favorite days here are spent lounging poolside with friends, sharing a laugh and a swim while sipping on ice cold coconut mojitos in the late afternoon Hawaiian sun. If I could make time stand still, it would surely be in one of these Modern moments. The Modern Honolulu, ph. (808) 943-5800, 1775 Ala Moana Blvd, Honolulu, the 96815.